Off the coast of New Zealand, there is an area where earthquakes happen in slow-motion as two tectonic plates grind past one another. The Pacific plate is moving under New Zealand at about 5 centimeters per year there, pulling down the northern end of the island as it moves. Every 14 months or so, the interface slowly slips, releasing the stress, and the land comes back up. Unlike typical earthquakes that rupture over seconds, these slow-slip events take more than a week, creating an ideal lab for studying fault behavior along the shallow portion of a subduction zone. In 2015, Spahr Webb, the Jerome M. Paros Lamont Research Professor of Observational Physics at Lamont-Doherty Earth Observatory, and an international team of colleagues became the first to capture these slow-slip earthquakes in progress using instruments deployed under the sea. The data they collected from the New Zealand site, published this year by lead author Laura Wallace of the University of Texas, will help scientists better understand earthquake risks, particularly at trenches, the seismically active interfaces between tectonic plates where one plate dives under another. Members of the team are discussing their work this week at the American Geophysical Union (AGU) Fall Meeting. 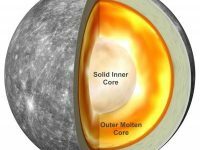 Previously, scientists thought that the soft sediments piled up near trenches were usually not strong enough to support an earthquake and that they would dampen the slip, Webb said. “We’re recently seen a lot of big tsunamis where there has been large slip right close to the trench,” he said. One reason the 2011 Tōhoku earthquake in Japan was so devastating was that part of the interface very close to the trench moved a large distance, around 50 meters, pushing the water with it, Webb said. While the main part of the Tōhoku earthquake involved uplift of only a few meters, the part near the trench doubled the size of the tsunami, leading to waves almost 40 meters high at some points along the coast. To be able to anticipate tsunami-producing earthquakes and more accurately assess regional risks, scientists are studying why some areas of trenches have these slow-slip events, why others continuously creep, and others lock up and build strain that eventually erupts as a tsunami-generating earthquake. 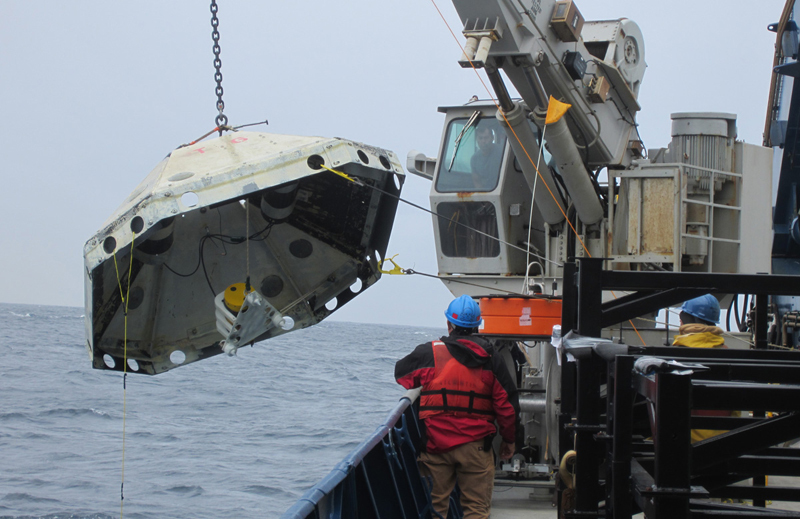 Webb has his sights next on the Aleutian Trench, just off Kodiak Island, Alaska. It is one of the most seismically active parts of the world. A large tsunami-generating earthquake there could wreak havoc not only in Alaska but along the west coast of North America and as far as Hawaii and Japan, as the Good Friday earthquake did in 1964. Lamont scientists, including Donna Shillington and Geoffrey Abers, who are also presenting their work this week at AGU, have spent years studying the structure of the Aleutian Trench and what happens as the Pacific plate dives beneath the North American plate. Webb and a large group of collaborators now want to find out where sections of the trench are sliding and where sections are locking to help understand what determines where it locks. Finding slow-slip earthquakes could help reveal some of those secrets. To study the New Zealand slow-slip event, Webb and his colleagues installed an array of 24 absolute pressure gauges and 15 ocean-bottom seismometers directly above the Hikurangi Trough, where two plates converge. Absolute pressure gauges deployed on the seafloor continuously record changes in the pressure of the water above. If the seafloor rises, pressure decreases; if the seafloor moves downward, pressure increases due to the increasing water depth. When the slow-slip event began, the instruments recorded how the seafloor moved. The scientists found that parts of the Hikurangi interface slipped and others didn’t during the slow-slip event. “It may be that much of the interface slips in these events but you have a few places that are locked, and those finally break and create earthquakes and tsunamis that cause damage,” Webb said. Most of the instruments used in the New Zealand study were built at Lamont in the OBS (ocean-bottom seismometer) lab started by Webb. 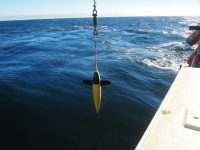 In Alaska, Webb and his collaborators have proposed an experiment that would again use a large numbers of Lamont-built ocean-bottom seismometers and pressure gauges, this time to collect data near Kodiak Island. Alaska is a special challenge for seafloor measurements. The ocean is quite shallow south of Alaska before deepening near the Aleutian Trench, and seismic instruments on the seafloor can be moved by strong currents or damaged by bottom trawling. Webb and the team in the OBS lab at Lamont developed a solution: they built heavy metal shields that sink to the sea floor with the seismometers to protect them. Once data from the instruments are collected, they will be made publicly available so seismologists across the country can begin to analyze the records in search of clues to the area’s earthquake behavior. By detecting patterns of earthquakes, scientists can help regional engineers plan construction to better withstand worst-case earthquake scenarios, but predicting earthquake remains elusive. Learn more about the work underway at Lamont-Doherty Earth Observatory, Columbia University’s home for Earth science research.